« Hunting But Not Getting! The fog was thick all morning. I was soaked from the mid-thigh down from walking through tall dew-laden grasses. I was feeling confident as I stood on the highest round top waiting for a gobble somewhere around me. Time continued on until I heard a gobbler somewhere out along the ridge. the sound was not very loud. This, however, could be due to the fog and foliage muffling the gobble. I did some calling , but never heard another gobble. I walked along a fencerow near the round top field. the fog made seeing any distance difficult. Suddenly, there he was a gobbler only about 50-60 yards from me exiting the woods. I lowered myself and erected an artificial fanned gobbler tail. this was to try to lure him closer and to conceal me more. remember I am along a fencerow. After awhile I eased the tail up peering under it through dense fog. The gobbler was higher on the hill now and began to strut upon seeing the tail. I did some calling. Still no gobble! An hour elapsed and I have yet to hear another gobbler. I peaked again and no turkey could be seen. I became braver and scanned the field I could see. He was gone. I crept over to the other side of the round top and called. I slowly walked along when there it was… the top of the fanned tail. This hill has many contour deviations in terrain so this fact allowed me to move farther aalong into a better position. I clucked and still nothing to indicate any interest at all. I decided to slowly ease up to look for that tail’s top again. The head popped up and the bird was down! I ran to collect the gobbler and saw another bird flying away. What just happened here? 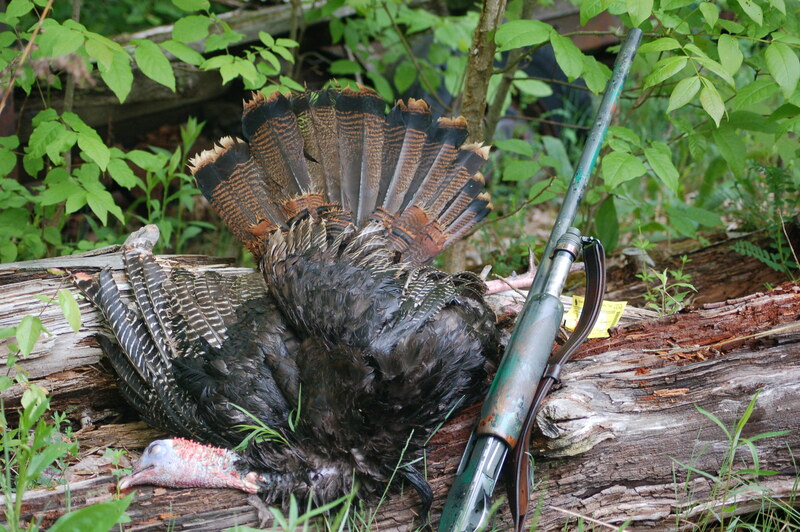 The gobbler I shot was a jake with a 6-inch beard. I never saw any other turkeys all morning while watching the gobbler. I was slightly disappointed, but still relieved the shot was true and humane. The young bird will nourish our bodies. I had seen some baby ground hogs with their parent. I had heard many species of warbler music, yet the big birds were not vocal at all. The fog was lessening as I drove home. As a note: I saw my first firefly this morning. “True and humane.” I like that. Hunters should always strive for such shots. I see you like some other journals also. Thank you very much. Some have been having issues receiving e-mail notices????? ?